How to Download Interview Schedule? 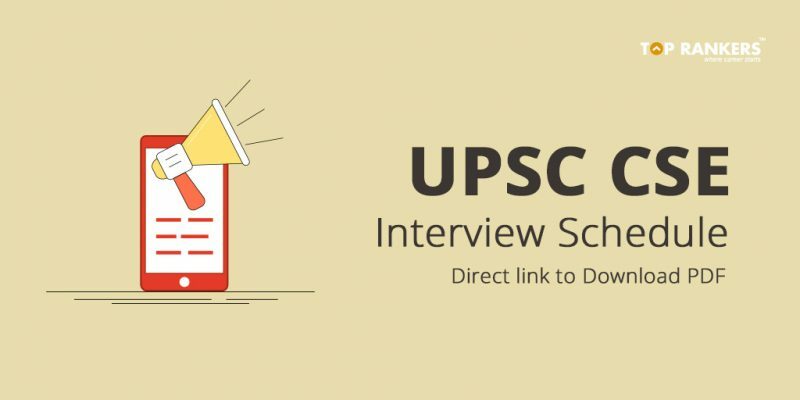 UPSC CSE Interview Schedule 2017-18 is out on the official website of Union Public Service Commision. Candidates who have cleared the main examination held between 28th October 2017 to 3rd November 2017, are eligible to appear for the interview/personality test rounds. As per the schedule shared by UPSC, the Interview rounds for Personality Test Programme are scheduled to begin from 19th February 2018, next month and will conclude on 25th April 2018. This will be the final round of selection of candidates for the Indian Administrative Services (IAS), Indian Foreign Services (IFS), Indian Police Services (IPS) and other Central Services (Group ‘A’ and Group ‘B’). Note 1: These two papers are qualifying only and mark obtained will not be considered or counted. A new page with the PDF document will appear on the right side of the screen. Now click on the PDF file to download the complete interview schedule. Stay tuned for more updates and notifications relatd to UPSC. If you have any query or suggestion, Do write us in the comments below.